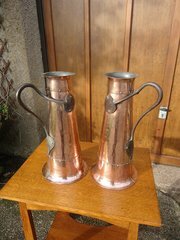 A stunning and very large pair of Arts & Crafts copper jugs with superb wrought iron handles ending in hearts towards the base and wrapping around to the front of the jugs. Lovely riveted detail and they have a Voysey look about them! These measure 43cms in height -17 inches and a diameter at base of 21cms - 8 inches. Offered in good original condition but are not water tight as inset base is totally secure. 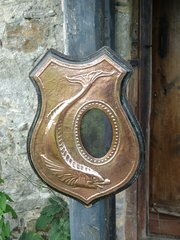 Lovely unusual Newlyn School copper Arts & Crafts photo frame with a fish wrapped around an oval glazed photo frame. Then copper is set on a stained oak shield which has a slight knock to base. This is definitely from the Newlyn school but of an unknown maker. Height 39cms, Width 29cms. The internal measurements of the oval frame are 12cms x 7.5cms. Arts & Crafts copper fire screen with stylised heart to centre. 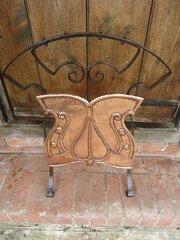 The copper panel is set on a wrought iron frame and is offered in good condition measuring 76cms high by 54cms wide. 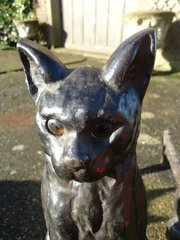 Pair of American Arts & Crafts Cat cast iron Andirons in original stone back paint. The original design being Howes in Boston. These were made in Tennessee and impressed accordingly. The cats have glass marble eyes that reflect the light of the fire. Height 41cms. Depth 40cms. Width at depth 18cms. Very heavy - would be delivered via courier. Arts & crafts copper and wrought iron cream skimmer attributed to John Pearson not marked as many of his earlier pieces were not. The mythical birds to the edge can be seen on many of hid earlier works. Offered in good original condition. The diameter of the skimmer is 34cms and the total length 67cms. Unusual Arts & Crafts double Inkstand by J & F Pool of Hayle with Bakelite liners which may or may not be original. Offered in good original condition with a very minor ding to front left hand corner. Height 5cms. Width 15cms. Depth 11cms.